Klasik Size Plus eggs are the latest addition to our choice range of farm fresh eggs. 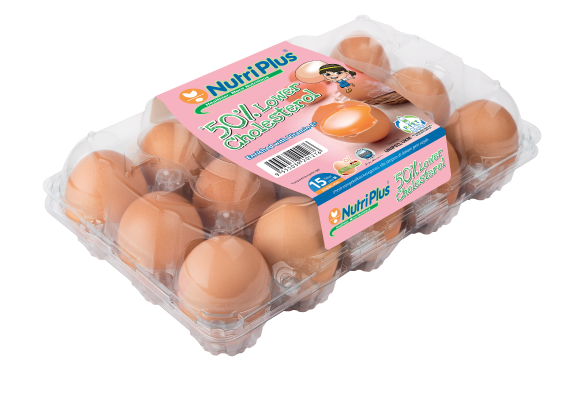 At Nutriplus we not only focus on production systems that include the highest hygienic conditions but also safe and durable packaging that ensure the best eggs end up on your plate. Our investment in R-PET, a strong and patented, fully recyclable plastic resin innovation guarantees that our Klasik Size Plus eggs are well presented in lightweight and shatter-resistant packaging. Attention to the production of high quality food production is key to our principles and has earned Nutriplus the Most Favourite Brand Award. Here at Nutriplus we believe in only the best! It is with that philosophy that we ensure that our Kampung Eggs – fortified with Omega-3 are totally organic. Our Kampung chickens are bred in an harmonious environment and feed on natural and nutritious feed mix that consists of soybean meal, corn, palm oil, selected vitamins and flaxseed to ensure their eggs are truly the best for your consumption. NutriPlus with Organic Selenium is the result of Lay Hong Berhad's collaboration with Alltech Biotechnology, an American company with 20 years' experience specializing in the field of biotechnology, utilizing a specially developed feed that can raise the level of Selenium in an egg. This feed has received the stamp of approval from the U.S. dod & Drug Administration (FDA) as a source of Selenium for broilers and layers. NutriPlus with Omega-3 is the result of feeding our chickens an all-natural based quality feed mix of soybean meal, corn, palm oil, vitamin mixes and flaxseed, one of nature’s richest source of Omega-3. This also results in eggs with much lower cholesterol compared to regular eggs. NutriPlus with Omega-3 contains 5 times more Omega-3 (200-400mg per egg) and 4 times more vitamin E (2.5-3.0mg per egg), along with Vitamins A, B12 and D.
Apart from helping maintain a healthy heart, Omega-3 is 'brain food' which aids in the development and function of the neurological system and of retina tissues. Omega-3 is also believed to reduce the risk of heart disease, hypertension, stroke, rheumatoid arthritis and some forms of cancer, as well as lowering LDL (bad cholesterol) levels. Eggs are highest quality protein source available, containing almost every essential vitamin and mineral needed by humans. In fact, egg protein is of such high biological quality that it is used as a benchmark with which all other protein sources are compared. The only drawback to this highly nutritious food has been the fear of its high cholesterol level. Modern feed technology has made this fear a thing of the past. NutriPlus Lower Cholesterol eggs contain a remarkable level of 50% less cholesterol compared to regular eggs, allaying any fears one may have regarding high cholesterol levels. With NutriPlus Lower Cholesterol eggs, you can safely reap the full nutritional benefits of egg consumption for the entire family! NutriPlus with Omega-3 Jumbo is the result of feeding our chickens an all-natural based quality feed mix of soybean meal, corn, palm oil, vitamin mixes and flaxseed, one of nature’s richest source of Omega-3 Jumbo. This also results in eggs with much lower cholesterol compared to regular eggs. 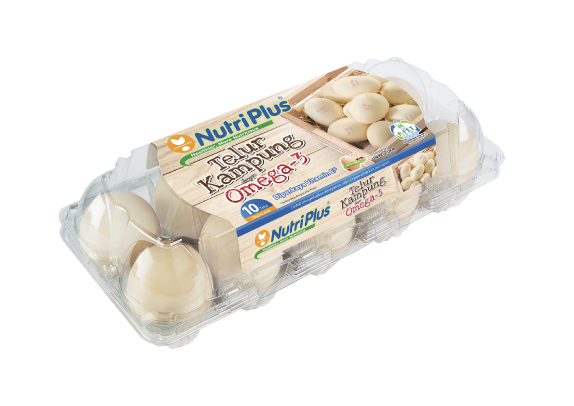 NutriPlus with Omega-3 Jumbo contains 5 times more Omega-3 (200-400mg per egg) and 4 times more vitamin E (2.5-3.0mg per egg), along with Vitamins A, B12 and D.
Apart from helping maintain a healthy heart, Omega-3 Jumbo is 'brain food' which aids in the development and function of the neurological system and of retina tissues. Omega-3 Jumbo is also believed to reduce the risk of heart disease, hypertension, stroke, rheumatoid arthritis and some forms of cancer, as well as lowering LDL (bad cholesterol) levels. NutriPlus Classic eggs enriched with added Vitamins E and B-Complex. Consumers are assured of the quality of the eggs, which are packed fresh from the farm after careful selection. These healthy and nutritious eggs are available in stores now! Eggs can be consumed in so many ways – hard-boiled, scrambled or poached, as omelettes or on toasts, baked into cakes, biscuits and pastries. However you choose to have it, eggs are a highly nutritious and an excellent source of protein. Lay Hong’s eggs are fresh from the farm and delivered to your neighborhood shop within 48 hours of being laid.